Last modified on January 25th, 2019 by Vincy. Creating PHP CRUD using OOPS will increase your coding confidence for developing a full-fledged web application project in PHP. The Create, Read, Update and Delete (CRUD) is one of the most fundamental building blocks in any software. Most of the times, even for developing the simplest web application, you will not be able to live without a CRUD implementation. Doing it using the MVC architecture is a better choice as it will help in better maintainability. Every Entity in an application will have CRUD implementation. For example, in a project management software the Project, Task, Owner, Client are the entities of the application. The data creation and manipulation for these entities will be done with separate CRUD functionalities. In this article, we will see how to create PHP CRUD using OOPS concepts. We will be using MySQLi to interface with the database. Implementing PHP CRUD using OOPS is the easiest implementation part in any PHP web application. Previously, we have seen Object-oriented CRUD system with PDO. Also, we have seen many PHP CRUD examples in previous articles. If you want to create PHP CRUD using ajax the AJAX inline CRUD example will be helpful. In this article, we are going to create a PHP CRUD using OOPS to create and manage students attendance. In this example, I have used MySQLi prepared statement for executing database queries. In the student CRUD, the student records are added to the database using MySQLi by collecting data via an HTML form. The form data will be sent to the PHP side with the CRUD action parameter. The action parameter signifies the action performed by the user so that the operation can be identified at the controller level and dispatch to the respective business logic. This is the control flow followed in the MVC design pattern. For each action, the model class will contain functions to perform PHP CRUD using OOPS. The student attendance statistics are created and managed in the database with the reference of the student id. Then, the student attendance statistics will be read and rendered in a grid view. In a previous tutorial, we have seen how to render an attendance graph with dynamic data using Google Charts. This example code is dealt with the Student and Attendance functionalities with separate CRUD. The file structure of this example is shown below. In this example, the landing page index.php will be the CRUD action controller. In this controller, the student and the attendance CRUD action cases are stacked by using PHP switch control structure. The actions parameter is passed with the URL based on which the controller case will be executed. The model classes Student.php and Attendance.php are consisting of CRUD functions which will be called from the appropriate CRUD cases. The model class functions are preparing the query and query parameters array. The query and its parameters are sent on invoking the appropriate database functions. In the DBController class, the query statements are executed after binding the query parameters using MySQLi. The control flow through the landing controller -> model -> DBController will be used to get the dynamic results. The dynamic results are rendered on the presentation layer which is created in the template files. This essentially summarizes the MVC architecture and the flow of control between the different layers involved in the implementation. 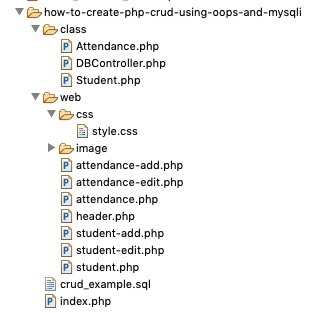 In this section, we will see the code to create PHP CRUD using OOPS features for managing student data using MySQLi. Also, we will see how to create the HTML view for providing a web interface for the users to perform CRUD actions. The student add/edit forms are created to the capture student details. The student list contains the edit/delete action controls to trigger the PHP CRUD action. Above student list view the Add Student button is shown to the user. By clicking this button the add form will be displayed with the name, roll number, class and the date of birth fields. 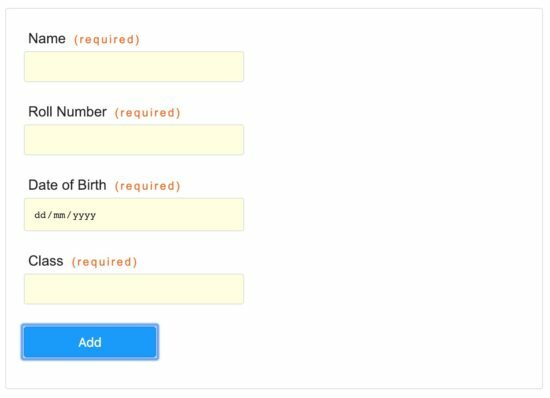 On submitting this form, basic client-side form validation is handled before submitting the data to PHP. This is the HTML code with the student add-form and the validation script. <form name="frmAdd" method="post" action="" id="frmAdd"
id="name-info" class="info"></span><br /> <input type="text"
The form data will be received in the server-side script created for the PHP CRUD using OOPS. From the student-add case, the form data are passed as a parameter to the addStudent function. In the addStudent() function the INSERT query and the query parameters are generated. These query details will be sent to the MVC controller layer to perform the student insert action using MySQLi. This is the code from the index.php which shows the student CRUD action cases. In the above code, the student data from the database can be read in two ways. For the list view, it reads all student record regardless of any condition. But, in the edit case, the student result is fetched based on the id to populate the existing data on the edit form. The create and update flow will mostly be similar to each other. This is the Student.php code containing the functions to execute PHP CRUD using OOPS and reflect the changes in the student database using MySQLi. 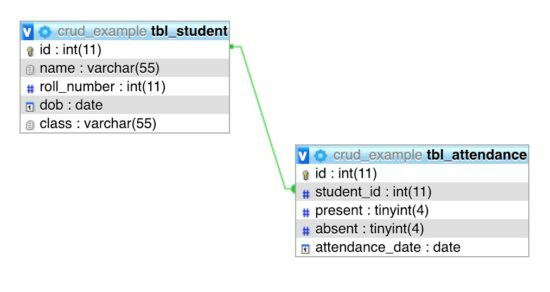 To create PHP CRUD using OOPS for the student attendance functionality, we need to consider both the student and attendance database tables. For example, when we want to read the attendance data for the edit page, the existing data has to be populated in the form fields. So the student and attendance tables are joined based on the student id. In this example, we are using left join in the SELECT query to retrieve the data from the database using MySQLi. Previously, we have seen several types of MySQL join Left Join, Right Join and more. If you are a beginner and want to refer how to use MySQL Joins then the linked article will be helpful. In the attendance functionality, the way the CRUD actions performed is varied compared to the student CRUD. In this CRUD, the bulk add, modify, delete is performed based on the attendance date. 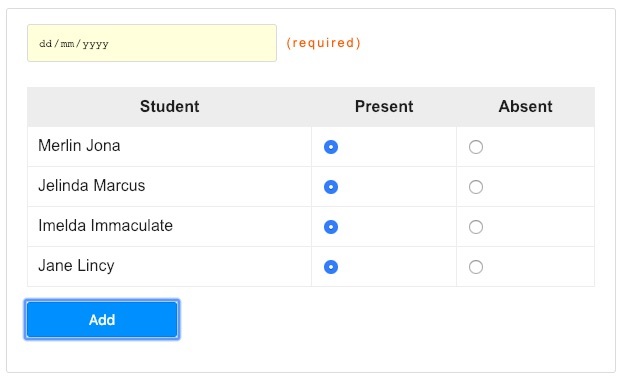 To create PHP CRUD for student attendance with bulk action feature, the list of student attendance data will be listed in a tabular format. The table is enclosed with an HTML form to post the attendance data to the PHP multi-record grid layout. The following code shows the Attendance.php class which contains the PHP functions to execute the bulk CRUD action. Before add or edit student attendance to the database, there will be a condition checked for the data duplication on the database. 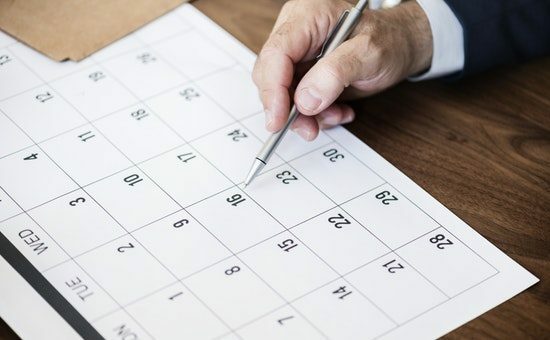 If duplicate data exists for a particular date, then it will be cleared before adding new attendance records to the database. For taking the student attendance data from the user, the list of all students will be displayed with radio options. These buttons will be used to select present/absent accordingly. The following code is used to show the attendance add-form to the user. In this form, the attendance date is a required field. By default, the radio options are selected as “present”. We can change it accordingly based on the student attendance status. The following screenshot shows the student attendance add form with a selectable date and attendance radio options. In the student attendance list page, the date-wise attendance statistics will be displayed in a tabular format. The update and delete action controls are added to perform actions based on the attendance date. When the user clicks on the delete icon from the attendance list page, the corresponding attendance date will be passed via URL. With the reference of the action send via the URL, the corresponding controller case will be executed. The complete source code download is available at the end of the article to set up this example in your machine. This SQL script should be imported to run this example in your machine. The following ER schema diagram explains the student attendance database table relationship used in this example. Unarguable OOPS is the most popular system used in software design. MVC architecture is the most popular design framework used. I am glad that I have exposed you to both OOPS and MVC principles in this article. OOPS and MVC cannot be covered in detail in a single blog article, they require a complete series to learn every aspect of it. I will try to write about them in detail in the coming articles. This article and the accompanying example project in MVC should best serve you as a starter project for implementing PHP CRUD using OOPS with MySQLi. I am so glad I found this, thanks a lot. I was looking for something similar to this, which I can hook up and build on top of it. I must say, the example is neatly written. One of the best light weight code I have seen. Hey Vincy, thanks for enabling the comments option. I have been following the blog for long and this was one of the most wanted thing. Thanks! Excellent article. Thanks for the free download. Thanks, Suresh and you are most welcome! There are great things in store for you. Keep the tuts/lessons rolling. Thank you for the kind words, Amos Bwambale. Sure I will add emoji icons to this comment form soon. Thank you. Vincy, this is the best CRUD system I found on the Internet. My appreciations to you. I have a request, can you please add “search and filter” option to this and make it a complete project? It will be of great help. Thank you. Thank you so much Steve for the appreciations. I am planning to write a follow-up tutorial as part 2 for this which will have list, pagination, search and filter features. It will be posted soon, keep watching. would be appreciate if you explain it further! I am beginner and can’t how its working. Usman, let me know which part of this CRUD you need more explanation. Thanks for the gr8 tutorial. Please add demo link if possible. Welcome Krushna. Sure I will add the demo for this CRUD tutorial soon. You can also easily setup this in your local. You helped me understand the OOP principle. You are a great teacher and an excellent programmer. Best of luck and many thanks for sharing your knowledge ! Thank you so much for this beautiful message Christian. Thank you.